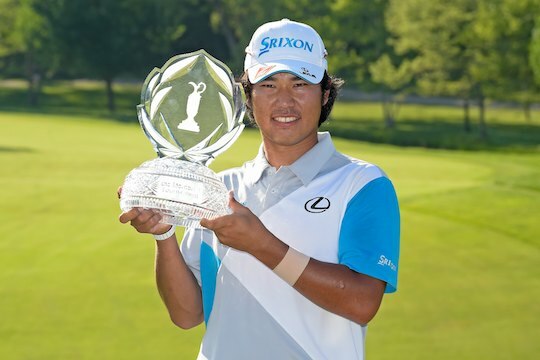 Japanese young gun Hideki Matsuyama claimed his first US PGA tour victory with a playoff win over American Kevin Na in the Memorial Tournament at Muirfield Village on Sunday. Matsuyama, 22, became the fourth Japanese player to win on the PGA Tour after paring the first hole of the sudden-death playoff in his 26th start on tour. His previous best finish in the US was a share of third place in the Frys.com Open in October last year, yet he has five wins on the Japanese Tour. Earlier Matsuyama recovered from a double bogey at the par-three 16th and a bogey at the 17th, before sinking a clutch five-foot birdie putt at the 18th to catch Na. The pair finished on a 13-under-par, one stroke ahead of the overnight leader, Bubba Watson. Watson had his chances on Sunday but when his drive on the reachable par-5 15th flew out of bounds resulting in a double bogey it cost him dearly. All week Watson had taken advantage of the shortish 440 yard par 5 – eagling it the first two days and carding a birdie in the third round. But the final day proved costly with loose drives not assisting the American who currently has two wins, including the Masters, two runner-up finishes and a third so far this season on the PGA Tour. World number one, Adam Scott, finished in a tie for 4th at 10-under, to miss the play-off by three, a costly double bogey on the 12th followed by a string of bogeys on 14,15 & 16 put an end to Scott’s chances for back-to-back wins on the PGA Tour following his victory last week at the Crowne Plaza Invitational in Texas. Scott was aiming to become the first player since Rory McIlroy in 2012 to win back-to-back tournaments on the PGA Tour. Scott was tied for the lead on the 11th hole before his round hit trouble in a tournament of what ‘if’s” for the Aussie. “The whole thing is frustrating as I stand here right now,” said Scott who carded a final round 71. Aaron Baddeley was at one stage six-under in his final round through 12 holes but dropped six shots over the last six to shoot even-par 72 and finish on three-under. He was joined there by Jason Day and Marc Leishman as the next best Australians in a tie for 37th. Greg Chalmers was the last of the Aussies to make the weekend finishing well down the leader board in a tie for 72nd. Steven Bowditch, Robert Allenby and Matt Jones all missed the weekend.